Effective sales prospecting requires communicating in a way that gets noticed. Your prospect's email inbox is likely flooded with messages, many originating from competing sales reps. In this environment, even a well-crafted message has a hard time standing out. Am I looking to start a conversation? "Salesy" InMails get lower response rates. Instead, think about how you can engage your prospect in discussion. Can I personalize this message? InMail is not a channel for spam or canned messages. Can you refer to a common contact or LinkedIn group? Is there a common company, experience or interest you can gather from the prospect’s LinkedIn profile? Perhaps there is a relevant LinkedIn group discussion you can either discuss or seek an opinion on. Do I have a clear call to action? After identifying high-quality leads, the next step in sales prospecting is giving the prospect a logical next step that gets both of you closer to a goal. Is this the right recipient for my InMail? 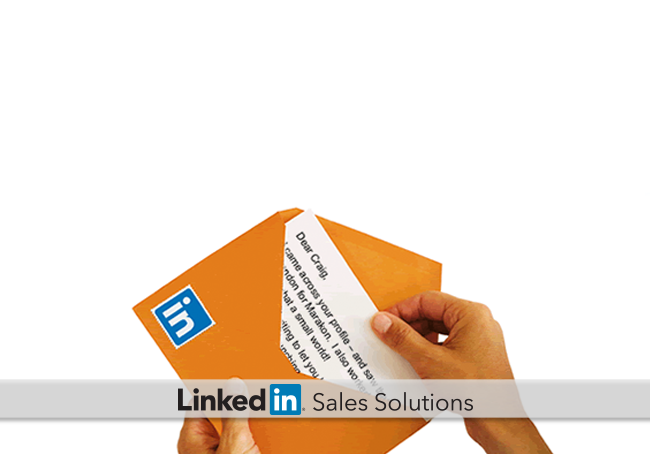 Your response rates are likely to be higher if you send InMails to active LinkedIn users. Active users have a high number of connections, are members of many LinkedIn groups and frequently update their profile. And don't forget about the option to "Get Introduced" because InMail may not always be the most direct path. The two most successful ways to gain access to decision makers are through internal referrals coming from within the prospect’s company and external referrals from someone the prospect knows and trusts outside the company. Is my sales profile supporting my message? Often the first thing your InMail recipient will do is check out your LinkedIn profile. If it's poor, or incomplete, the likelihood of receiving a response will also be poor. Your LinkedIn profile should establish credibility and showcase the potential value you can provide. For example, “Fellow industry group member looking for feedback on an idea.” At this point in the sales prospecting process, your reader likely has no context into who you are and what you want, so your subject line should provide the gist, along with a compelling reason to open the InMail. A simple “Hello” won’t cut it. You can never go wrong with, “My name is… and I…” A common mistake is to assume the prospect will check out your LinkedIn profile to learn more about you. Why give them an extra step? Tell them a little bit about yourself – at least the relevant part – at the outset. Clear, concise messages are the best kind – especially for busy prospects. Try to say what you’re looking to achieve in one to two sentences, if possible, and make sure what you’re asking for is in proportion with your relationship. Make it clear what you’re asking for, but perhaps even more important, make it clear that you’re grateful in advance. After all, you’re asking a favor of someone you don’t know all that well… yet. Saying something like, “I greatly appreciate your expert insight and I look forward to hearing from you” is one of many ways you can go about this. A strategic InMail is a fantastic way for your sales prospecting efforts to stand out, but the clearer, more relevant the message, the more likely you are to get the results you seek. If you need more high-quality sales prospects to communicate with, learn how LinkedIn’s Lead Builder and Premium Search can help.